This is a classic in the occult literature. That means that everyone knows it; everyone discusses it; but very few people have ever taken the time to actually READ it. Of course it is dry reading. Of course it appears dated (it was originally written in 1930), and difficult to wade through. None of that, however, is important. What is important is that Dion Fortune (nee Violet Firth) was both a pioneering psychoanalyst and a practicing ceremonial magician. 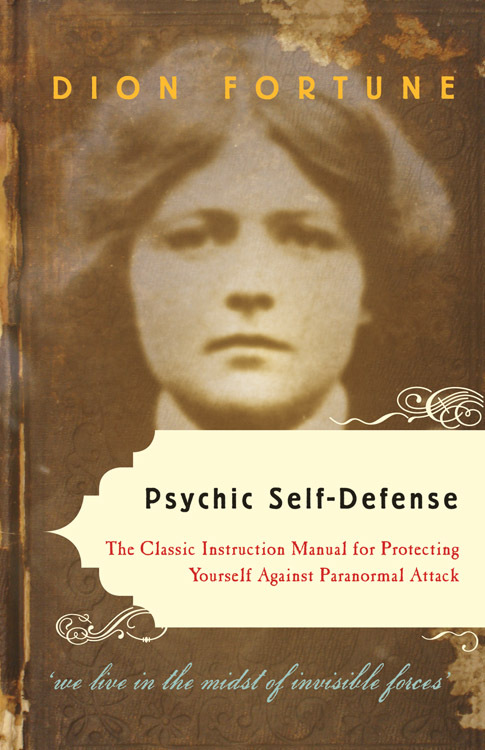 This unique perspective allowed her to approach the problem of “psychic attack” from multiple points of view. I first encountered this book over 40 years ago when I was beginning my own training in Paganism and magick. I found it tedious at the time, but suspect now that was simply a result of the combination of being expected to read it and youthful rebellion. This work is “Christ-focused” as was the author herself. Do not let that deter you. However, if you are an easily offended practicing Witch or Wiccan, put this book down and walk away from it. Dion Fortune was a number of things (member of a Golden Dawn lineage and founder of The Society of the Inner Light, in addition to the things mentioned in the first paragraph), but one thing she was not was tolerant of those who followed the path of the Witch (which she saw from a traditional Christian viewpoint). If your practice involves the use of magick, however, you need to overlook HER prejudices and take advantage of the information contained within these covers. She has numerous experiences, which she relates anecdotally, dealing with various forms of magickal/psychic attacks and/or misadventures. There is a tendency in the world of the paranormal to see malice behind every misfortune. If an aspiring occultist has a headache – it must be a psychic attack. If one loses a job – psychic attack. If one has nightmares – ditto. While such attacks are certainly possible, they are in no sense common. The use of “occult powers” to attack someone is, in most cases, overkill. It is far more energy efficient to simply walk up to your intended target and deal with them physically. Ms Fortune makes every effort to help the reader to distinguish between the various types of misadventures one may encounter (physical as well as psychic); to determine the root cause and suggest solutions to them; and how to protect oneself. There are a large number of items which she does not explain, however, since she was oath-bound to protect that information. It may seem that, to many modern readers, that explanation is used too often. It is necessary, however, to remember the time and circumstances under which this book was written (originally published in 1930). At the time, and in the society in which she lived, occultism was talked of in hushed tones, in private gatherings of trusted associates, and almost always with a Christian bias. In many cases her suggestion amounts to “Find someone more qualified to handle the problem.” That is still good advice. If you aren’t sure of the origin of your problem; if you can;t be sure you are capable of handling the forces and energies involved; if you have ANY doubts, find someone else to give you a hand. It is far better to ask for help and then discover that you COULD have handled it than to go into a situation and discover partway through that you are in over your head. This is a useful book, although it is not an absolute necessity. Still…to have it on hand, and to review it periodically would be a good idea.